Wherever you live, it’s not easy to find comfortable shoes if your feet are wide or swollen, but in Princes Risborough, Sandpiper Footwear is easily available. A wide range of footwear in Extra Wide Fittings available right here in Princes Risborough. We have a high quality range of comfort shoes, slippers and sandals for wide, swollen or sensitive feet, including shoes for diabetics and shoes for orthotics. Extra Wide Comfort Hosiery for the fuller figure. 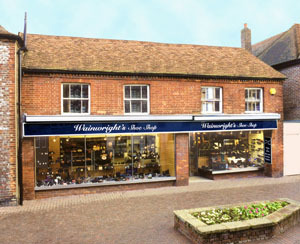 Wainwright's have been synonymous with supplying high quality footwear in the Home Counties since 1919. Their quality of service and attentiveness to detail is second to none. They have and still are supplying footwear for many famous people, but don't let that put you off you will be treated like royalty whoever you are when you visit one of Their shops. Princes Risborough is a beautiful Buckinghamshire town situated at the base of the Chilterns between High Wycombe and Aylesbury. Albert Wainwright founded the business in 1919 and brought the shop to Princes Risborough in 1936. The present shop which you can see above was purchased in 1949 and is the head office today. It is a joy to have such a beautiful 17th century Grade 11 listed building as a head office and certainly lends itself to being referred to as a shop of character. Wainwrights like to think that the diversity of stock and the service that they offer is what sets them apart from the those shops that you tend to find in shopping centres. If you're fed up of being ignored in these types of shop then have a day out and come and see what they have to offer you. They may not stock everything of the brands that they carry but they reckon that overall they have a great selection of footwear for all the family. Indeed they could offer something to all the members of a four generation family!